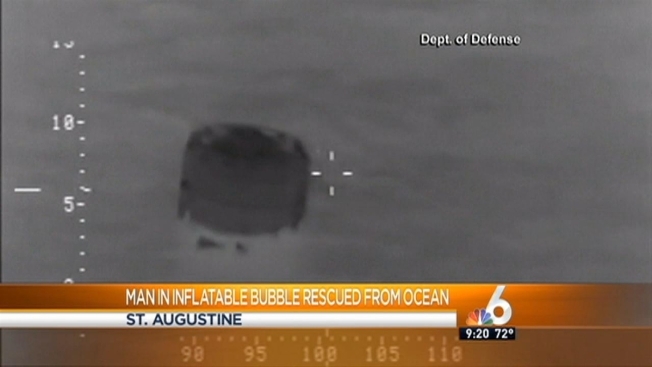 A man trying to reach Bermuda in an inflatable bubble has been rescued by the U.S. Coast Guard off the coast of St. Augustine after he began suffering from fatigue and asked for help. Coast Guard spokeswoman Marilyn Fajardo said in a statement Saturday that air crew were able to safely pick up Reza Baluchi and his vessel Saturday morning. He was transported to a nearby Coast Guard station in Clearwater where he was evaluated and found to be uninjured. Officials originally received a report of Baluchi floating in the bubble on Wednesday. The Coast Guard arrived on the scene about 70 nautical miles east of St. Augustine to find him disoriented and inquiring how to get to Bermuda. Crew members from Coast Guard Cutter Webber conveyed the dangers of the proposed trip and asked him to end it, noting his lack of sustainable supplies. Baluchi had only protein bars, bottled water, a GPS and satellite phone aboard his vessel. He initially refused assistance, but officials continued to monitor his movement until Baluchi activated his locator beacon Saturday because of fatigue.